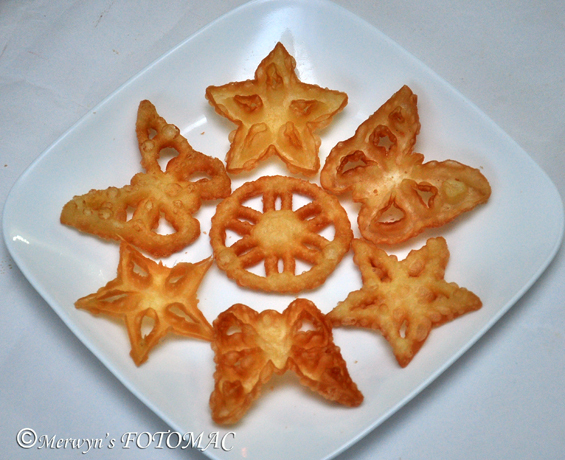 In Goa, they are known as ‘Roce Cookies’ due to the inclusion of fresh coconut milk in the batter. In Mangalore it is known as ’Kokkisan’& in Kerala they are known as ‘Acchappam’…Acchu means mould & appam is the batter. In Kerala as well as Mangalore, fresh coconut milk & rice flour or fresh rice paste is included. It is also known as Rose Cookies simply because of the flower design or just because of the flavor of rose water/rose essence to the batter. Well, some people pronounce roce as rose! 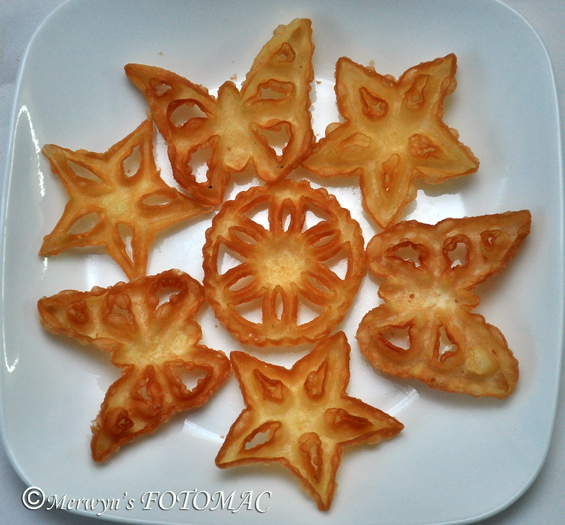 The beauty of the Roce Cookies can be amplified because of the beautiful & intricately designed iron moulds/forms. Rosette irons are available in a variety of shapes & sizes. In Europe, far East & Middle East; there is a vast array of designs to choose from while in India they are limited. Sometimes, if one is lucky you may find imported rosette moulds with Christmas motifs. There are various ways of sweetening the cookie…you may add sugar in the batter itself or dip in a sugar glaze or just dust/sprinkle powdered sugar after it is deep fried. They make wonderful treats & look very pretty on the Christmas goodie platter. In European countries, rice flour/paste & coconut milk is not used. In Goa, rice flour /rice paste is not used at all. But by not using it, the crispness is not retained for long. My mum & grand mother always used flour, eggs, coconut milk, sugar & vanilla essence but I like the Kerala/Mangalorean way of including rice flour/rice paste because it retains crispness for a long time. Grind one cup fresh grated coconut & cardamom (if you decide to use it instead of vanilla essence) in a grinder using about ½ cup water to a fine paste. Transfer the contents onto a muslin/cheese cloth/fine strainer or mesh spread over a sufficiently deep vessel. Rinse the grinder with some warm water about 1/3 cup & add to the contents in the cloth/mesh. If using cloth then bundle up the cloth & its contents & gently squeeze out the coconut milk. Use this coconut milk for the roce cookie batter. In a sufficiently large bowl, first combine the dry ingredients – maida, rice flour, sugar & salt. Stir well. First add the coconut milk & then a little water at a time to get a thick consistency. Use a balloon whisk to stir. Add in the egg & vanilla essence (if using) & stir to mix well. Do not agitate to form bubbles. The prepared batter must be smooth & lumpless but thick like dosa batter consistency. It should be able to stick to the mould. It should not be too stiff & thick & neither thin & runny. Heat sufficient oil till hot in a kadhai/wok on a med. flame. The quantity of oil should be enough for at least 3-4 cookies at a time. It also depends on the size of your kadhai. Also the cookies should be able to float when you are deep frying. Dip the mould in the hot oil for about a minute or two. Lift the mould from the hot oil & drain to remove excess. Do not drain for too long or the mould will turn cold. Dip the mould very carefully in the batter until the batter coats the mould about ½ or ¾ depends on your preference but make sure it does not cover the upper surface of the mould. If it covers the top then the cookie will not release in the oil. It is also important not to leave the hot mould dipped for too long into the batter as the heat from the metal mould will cook the batter in the bowl. So be alert, quick & brisk. Dip the hot drained mould in the batter briefly, covering it as mentioned above, shake off excess gently & immediately, carefully lower the battered mould in the hot oil. The mould should be compeletely encased in hot oil but it should be suspended & not touch the bottom. Adjust the flame if necessary… if the cookies are browning too quickly. Wait for a few seconds till the cookie cooks & retains shape. While it is dipped in the oil, gently shake in a tapping motion continuously. This helps the cookie to release itself from the mould & float in the hot oil. Once the cookie is released in the oil, the process of frying & gentle browning continues. In case it is difficult for the cookie to release completely then use a long tooth pick & pry the sides gently to release it. Repeat the process & allow about 3-4 cookies to fry in the oil. This depends again on how many can be accommodated in your kadhai. Flip over & fry the other side as well. Do not over brown. Flip the cookies back to the right side facing up & lift them one by one with a slotted spoon. Drain excess oil completely against the side of the kadhai & transfer on to a tray lined with absorbent kitchen tissue. Cool the roce cookies completely & then store in an airtight container. Enjoy at Christmas or at tea time or whenever you feel like eating them! Want desperately to try this out Hilda as I love Roce cookies.. but dont hve the forms here in Canada.. do you know of any substitude we could use instead of the iron forms ?? Thanks for the recipe!! I brought out the mould after twenty years to try it out & remembering my mom & my childhood. But unfortunately the batter is crumbling & disintegrating in the oil!! Why is it so? Dear Hilda….thankyou for the recipe. it was awesome. I especially love your moulds…butterfly etc. where can I buy the same online?